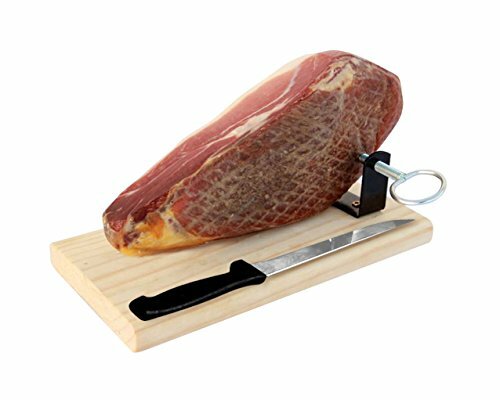 A good Spanish ham is a delicacy in itself and makes a wonderful starter or lunch just with a hunk of crusty bread and a handful of olives. If you’ve splurged on a wonderful whole Jamon Iberico or Serrano though, and have already feasted on wafer thin slices of ham, you might want to spare a few delectable slices to cook with and enjoy the way its distinctive flavour complements a wide variety of dishes. For a wonderfully indulgent tapas or starter when asparagus is in season, try these tasty asparagus spears wrapped in slices of ham. They look great and are terribly moreish! Preheat the grill to high. Halve the slices of ham lengthways. Wrap one piece around each asparagus spear on a diagonal so that it covers the length almost to the tip. Brush the wrapped asparagus with a little oil and season with salt and pepper. Grill for 5-6 minutes, turning the spears frequently, until the asparagus is tender but still firm. Serrano ham adds a wonderful extra dimension of flavour to firm white fish like cod and hake. Here it is wrapped around the fish and served with roasted red peppers for an authentic Andalusian summer meal. Preheat the oven to 200C. Roast the red peppers whole for about one hour. Once they have cooled slightly, peel the skin and remove the seeds. Cut them into strips. Lightly oil a roasting dish. Wrap each fish fillet in two slices of Serrano ham to make a parcel. Secure with cocktail sticks if necessary. Sprinkle the parsley on top, season with salt and pepper and a drizzle of olive oil. Roast in the oven for about 25 minutes until the fish is cooked and the ham is crispy. Serve the fish fillets on top of the strips of red pepper, with a green salad alongside. Lentil soup is a wonderfully warming dish for chilly autumn and winter nights. With the addition of a good Spanish ham, the depth of flavour is even more amazing, guaranteed to bring a smile to your face, as well as warm you to your toes. In a large pot melt the butter with the olive oil. Gently sauté the onions for a few minutes, then add the carrots, celery and ham. Cook for about 10 minutes until the vegetables are soft. Stir in the lentils and then add the stock. Bring to the boil and simmer until the lentils are tender. You may need to add more water if the lentils soak up all the stock. Season with salt and pepper to taste. You can eat this as it is, or if you prefer, puree it to a smooth soup and stir in some cream.